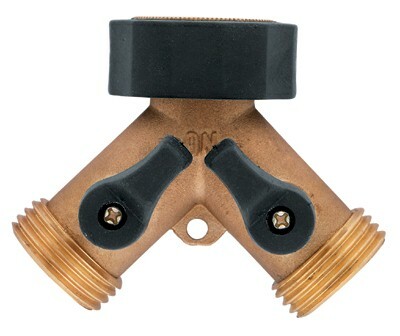 Two Way Brass Garden Hose Splitter converts one faucet into two outlet faucet. Two Way Brass Garden Hose Splitter converts one faucet into two. Each side of the "Y" fitting has an independent control valve to get the desired flow your looking for. This Two Way Garden Hose Splitter has a swivel hose connection for easier attachment to the hose faucet. The leak-free ball valves allow you to adjust the flow. Durable brass construction for long life.